Mc Clatchy recently did an article on OTR and how is is number one nationally in "Income Disparity", the difference between the haves and have nots and points to the fact that one of the poorest neighborhood in the country is gentryfying. Something I noticed 3 years ago. At the same time 3CDC announced they are planning on more restorations of high income single family homes in OTR in the 200-750K range because there is demand. These development 'may' signal that OTR has really turned a corner, even in a bad economy. Will we now see a shift, as has happened in many cities, of the poor largely concentrated in the older areas of the townships creating a ring of affluence in the urban and far suburban neighborhoods witha ring of poverty in between. If so how do we plan for the inevitable in terms of services and trransportation as a city moving forward and is this shift a good thing or bad thing for the city overall? It does seem like many churches and social service organizations are 'abandoning" OTR as property values rise and there is decreasing 'clientel' to service. Will all this shift to the townships? I have observed this happen in other cities I have lived in and I wonder how you think all this will play out? I didn't read your whole post, but this could possibly be a good thing. I'm not sure how long this income inequality has existed, but it could signify that some of the more wealthy people are actually moving into OTR, if this has happened rather recently. This could really help the neighborhood and accelerate the renaissance that is occuring in OTR, thus creating a positive feedback loop. Last edited by 13th Alphabet; 11-29-2011 at 04:45 PM.. I enjoy 14th and Sycamore more each day. We got a new guy, a 70 year old couple who relocated from Wyoming (I speak the truth Jen) with a friendly dog and a good attitude. He and Lucy (the dog) were fascinated by the recent man hunt for the escapees from the Justice Center. The cops set up perimeters and signaled each other with beeps from their sirens to the delight of Lucy. Eventually the perps were apprehended and everything returned to a quiet evening. 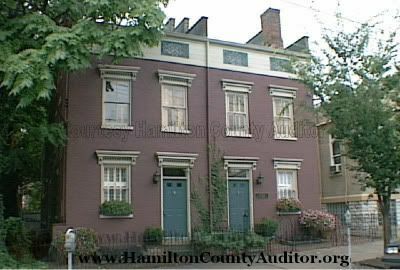 Makes me see it as more and more likely that I will renovate the 11 rooms (2700 square feet) in the two 1860's row houses' space above my office and downsize to OTR. Last edited by Wilson513; 11-29-2011 at 04:06 PM.. I enjoy 14th and Sycamore more each day. We got a new guy, a 70 year old couple who relocated from Wyoming (I speak the truth Jen) with a friendly dog and a good attitude. He and Lucy (the dog) were fascinated by the recent man hunt for the escapees from the Justice Center. The cops set up perimeters and signaled each other with beeps from their sirens to the delight of Lucy. Eventually the perps were apprehended and everything returned to a quiet evening. Makes me see it as more and more likely that I will renovate the 11 rooms (2700 square feet) above my office and downsize to OTR. Typical cynical attitude that pervades this city. Yes, I thought you were joking, my apologies. I misinterpreted the post as sarcasm. Did the guy move from the state of Wyoming, or Wyoming, OH? Apology accepted. It would have been good sarcasm; humor is often found in a take on the truth. It actually is very interesting down here seeing the clash of culture. The new guy is from Wyoming Ohio. Very cool guy who was a cabinet maker in NYC and retired to his wife's home town (Cincinnati) and now is on this new adventure. If I renovate the upper floors, he my have a great part time job. He doesn't know it yet. But I am sure he would enjoy it. ^Very good to hear. Hope the trend continues with more people like them. And, probably both he and you can pull out at the drop of a hat once the quaintness wears off. Nice looking digs -- not my style, but nice looking nonethess. Just remember, spending nights there is not the same as wandering in from 8:00 a.m. to 5:00 p.m. Monday through Friday or some such thing. Yea, I know that. I have some crime scene tape in my office as a reminder of a murder a year and a half ago where the tape was tied to my iron fence. But, I am down there a lot more than 8-5. Some evenings, every weekend day. My vehicle garage is across the street and I go there all times of day and night to switch out vehicles. But, your snarky reference to my interest in OTR as "being quaint" is pretty stupid since you really don't know me or why I would be moving down there.